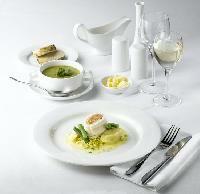 hotel tableware that are made from high quality stainless steel. we also do custome design development and as per the customer requirement we make there products with there name and packaging. To ensure distribution of orders within undertook period, our organization has an outstanding supply chain system in place. We source direct as well as indirect raw materials only from the certified vendors present in the market. Our team of quality experts strictly checks the entire range against varied parameters.